We’ve been up north for a few days finishing off the mini reno; it sure doesn’t get easier as one gets older! A quick synopsis: wood panelling painted white, ceilings and gaping holes were caulked. Laminate floors installed and waiting for one more box (how did that happen? We are 6 pieces short, damn it! We both did the math, TWICE!) Baseboards have been cut but not fully installed (need to finish the floors under the couch first). New kitchen shelving installed with task lighting. New porch blinds installed with bottom hooks! Garbage packaged and stored for handy man removal. A few more décor items and we’re done! Just in time for closing ;)! With all that standing up, sitting down it feels like I’ve completed a marathon, but not really, I’m just a spectator of sports. And we all know what a crazy sports fiend I am, I just can’t get enough of it ;-). In fact, I have every single tuner in the house tuned into different sports channels or talk radio channels just to keep on top of it; then there are the push notifications every time a player does something worthy — like fart, for instance! OK, I may be BS’ing a little but I do get a little drawn in particularly when the sport is baseball and we’re talkin’ about our beloved Jays! Blue Jays that is! My good friend Jed from Sports Glutton asked me to do a guest post as part of his MLB Series (except that I kept calling it the MBL whenever I talked about it, drove poor JT nuts!) and I couldn’t resist. Thank you Jed, I’m not only honoured to do this guest post, but I am flattered beyond belief and I hope to have done your lovely gluttonous blog worthy with this post. Our beloved Jays are due for a world series win; no — really, I’m serious. I’m told (and god knows I’m no authority) that this year the Jays have the most expensive players and one would think that with that kind of ‘quality’ we would get some wins…except it’s taking a bit of time — you see, those poor Jays had a bit of a rough start, but we’re back on track and as of writing this post, we’ve worked ourselves back within striking distance of first place in the division! Woohoo! 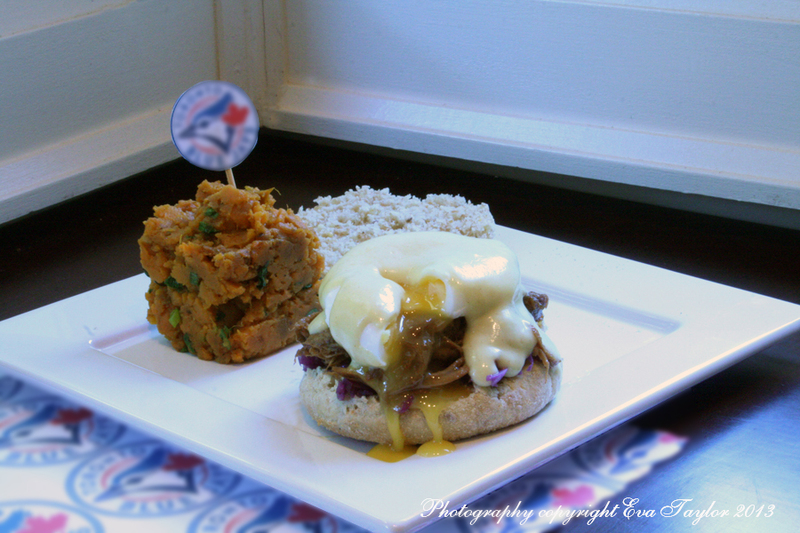 Even with the Jays resurgence the Jays should be hungry for more, I am 100% sure they would want a highly gluttonous meal like Canadian Whiskey BBQ Sauce Pulled Pork Benny and Homerun-fries, don’t you? I developed this recipe for Jed and there are a few things I would have done differently if it was for kitcheninspirations.wordpress.com, but because Jed was a little concerned; that I would make it too healthy, I really stepped it up a notch, within reason, of course! Thanks again Jed, I am truly honoured. Please head on over to Jed’s blog to check it out, you will be surprised and delighted with what you see. The Dijon Béchamel was just the perfect gluttonous addition. Makes enough for 10-12 Bennies if you want to use it all on that, but the pulled pork is wonderful as leftovers in sandwiches, pizza and wraps. Combine the spices and mix well, set aside. In a very hot skillet, heat about 1 tbsp canola oil and sear the pork well. Set the pan aside — DO NOT WASH. Carefully rub the spice mix on all sides of the pork and set into the slow cooker. 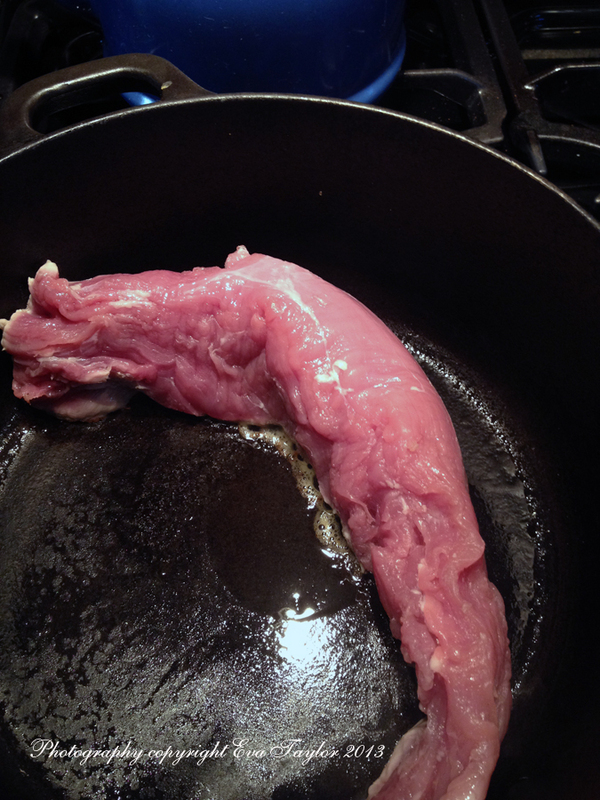 Searing the tenderloin; it’s so loud, I can’t hear the talk radio! The beast has been seared, you can tell because the talk radio is fully audible. Combine all of the ingredients in the same pan you seared the pork in and bring to a boil, scraping off any of the bits left behind by searing the pork. 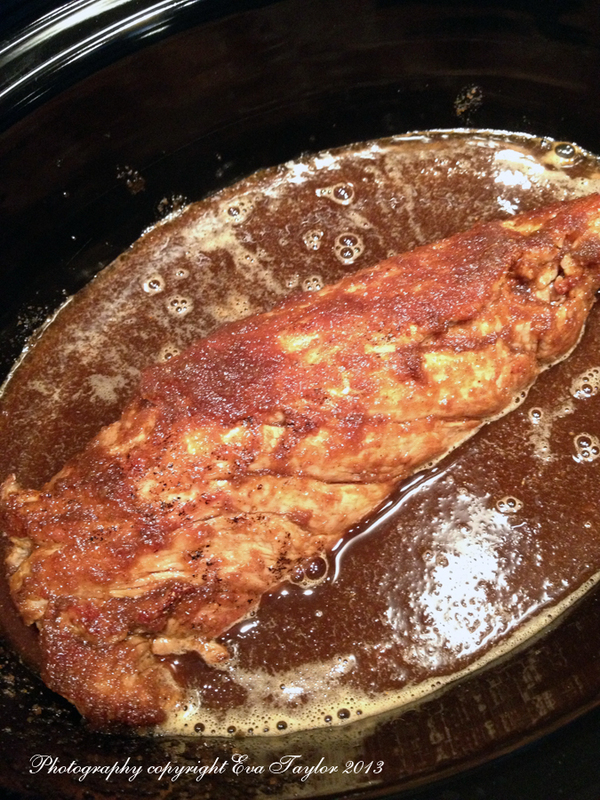 Pour the sauce over the pork in the slow cooker, cover and set the heat to Low and the timer to 4-5 hours. Turn pork in the BBQ sauce occasionally. The pork is done when you can take two forks and start pulling it apart. 1 sweet potato, peeled and cut into 1 inch (2.5cm) cubes. Boil or roast the sweet potato cubes until very soft. Heat canola oil in a pan, pan-fry the sweet potato cubes, smashing them with a fork. You want a slight crispy texture on the exterior of the smashed cubes. Stir in the chopped green onion. Melt the butter in a small saucepan on medium heat. Stir in the flour and cook but don’t brown it. Slowly stir in the milk, whisking to incorporate the flour butter mixture so it’s not lumpy. Keep whisking until you reach your desired thickness (it will thicken more as you cook it). Add the Dijon and blend well. 1-2 Whole wheat English Muffins per person, torn in half and toasted. I seared the pork in my favourite cast iron pan and therefore could not use it for the BBQ sauce as the acidity of the sauce strips off the seasoning from the pan. Had I done it in my enamel cast iron pan, I would not have had an issue. We added the braised purple cabbage for more gluttony with the benefit of texture, colour and flavour, feel free to omit. To perfectly poach an egg, heat 10cm or 3.5 inches of water to a gentle boil. Add 1 tbsp vinegar (this helps to set the egg white so it doesn’t get all stringy) salt. Break eggs into individual cups or small bowls. Gently turn the egg into the hot water allowing the water to flow into the small cup or bowl, once the egg is setting, gently turn it fully out and giving it a summer-salt. Repeat with all eggs and set the timer for 2 minutes. 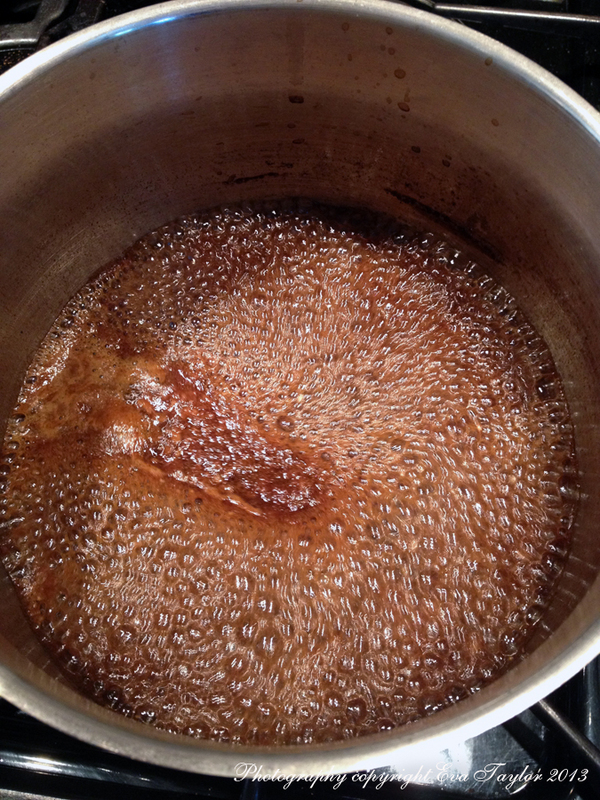 The water should be gently boiling not roughly bubbling. When the timer goes off, remove each egg onto a paper towel to dry. Serve immediately. ps… photos.. I want photos of the before and after!! I love that sort of make-over!!! Ah yes, the photos will come because I too like to document the befores and afters…it’ll have to wait until I am totally finished the project, décor and all! 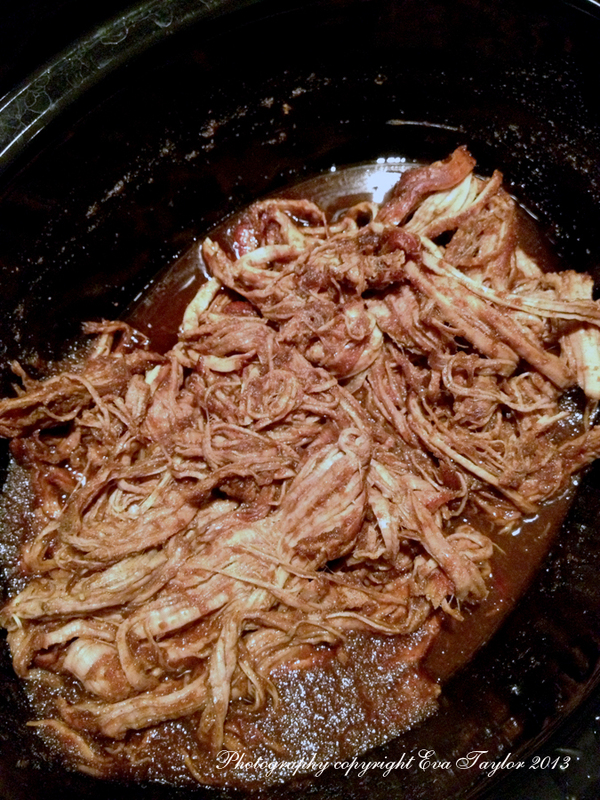 Thanks Barbara, I’ve never made pulled pork with the shoulder (I think that’s what it is normally) as I tend to shy away from very fatty meats, so this pulled pork actually hit my taste buds perfectly and I didn’t feel too guilty about eating it either! I saw this method of poaching on a TV show by a chef, and it’s worked beautifully for me. You can also pre-poach your eggs by just setting them and dropping them into cold water to stop the cooking then when you’re ready, just drop them into boiling water for a minute or so to finish cooking and presto, you’re done! pulled pork bennies?? I’m in love, that’s for sure! Thanks Maureen, it was a dual effort for sure but no worries, I was able to source another box of the flooring so we’re all good. Tongue in cheek Celi, I’m about the most anti pro sports person around. In fact, when JT tells me something about sports, I only hear WAWAWA! Like the adults in Charlie Brown cartoons! Always factor in that 10 percent overage. Someone, I’m not saying who thought she could slide a bit on that and we used every single board when we redid the floors. She sees this as proof of her genius. Anyway, the food looks great. I could eat 10 percent too much of that easy. Thanks so much Bam, meeting Norma was very lovely indeed. The pulled pork was quite gluttonous! Love the first photo, beautiful presentation. Your Canadian Whiskey BBQ Sauce sounds like a very versatile sauce. Must make your sweet potato homerun-fries when my sweet potatoes are ready for harvest. Hi Lorraine, I saw your short rib post and thought similarly! I made this dish about a month or so ago when it wasn’t as warm as it is now, today I would likely make the pulled pork in a pan on the BBQ to minimize the heat in the house. Eva, everything sounds and looks so fabulous! And so much work! It must have taken you a whole day! 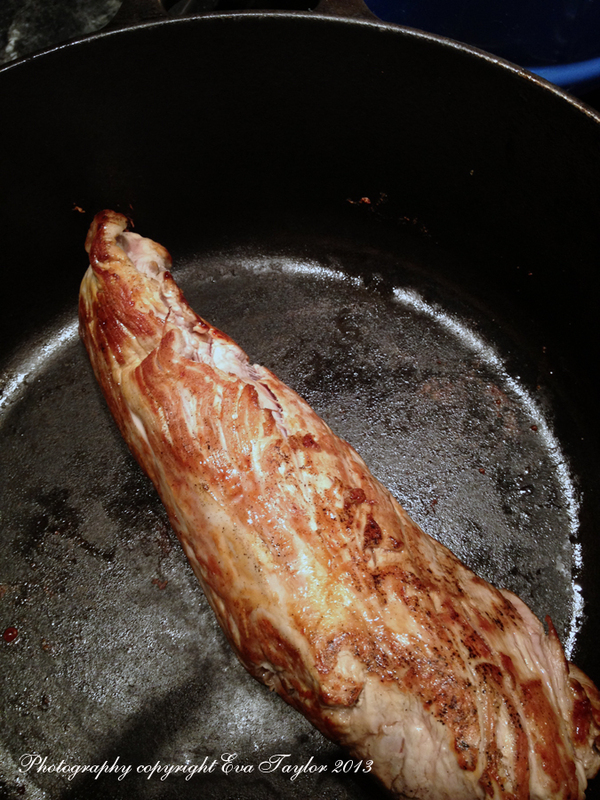 The pulled tenderloin looks so irresistible… Congratulations for the step-by-step photos. They look almost as delicious as the final result! Can you believe I have never had pulled pork? I have heard it and saw it many times, but seeing your version with whiskey I think I have no choice but make it. Thank you kindly Sissi, normally I just make it with a simple BBQ sauce but because I was guest posting on The Sports Glutton’s blog, I thought it wouldn’t be gluttonous enough! It is indeed very tasty and there are a lot of left overs which make for amazing sandwiches or even a topping for pizza, or fresh rolls or even spring rolls! The possibilities are endless. I do hope you enjoy it.